Geesh, talk about taking your time there caveman! Ever since going Paleo, I have had this on and off again dry skin (sometimes really bad, sometimes alright), and I just put it down as a Paleo thing. I even thought maybe it was just my body going into shock from the change of diet. Then eventually, I just got used to it and managed it with coconut oil. The waking up after eating almonds before bed with a closed throat was more startling though and alerted me to a problem. Now, I’ve never recommended almond milk before to anyone and never liked it myself. There was something really unnatural about it, and I knew caveman would have sooner discovered coconut milk than almond milk so I have used that. However, I noticed that nearly all my recipes and even the ones I love have this damn almond meal in them. Point is, after cutting out almond meal for over 10 days now – my face is completely normal again, and I feel much better. Did You Know 1 Cup Almond Meal has over 90 almonds? So I did some research recently on almonds and discovered some not so great facts about them. The info is condensed below and with some links as well. It takes around 90 almonds to make one cup of almond meal! If you break that down into a serving size that’s 30 almonds. Would you eat 30 almonds in one sitting? It’s funny because when it came to baking paleo goods I always got so excited when using Coconut Flour and or tapioca and you guessed it, that is the secret to the alternative. In my famous buns recipe, I tried making them with no almond meal and simply substituted the 1 cup of almond meal with a half cup coconut flour and half cup tapioca, and it worked!! The buns came out perfect and are even healthier for you! I will update the recipe soon. You may have to play with other recipes by adding more liquid (of your choice), but it should work, and with time I will replace all my recipes that have almond meal with this alternative. I hope this post can help a few people who may also have sneaky side effects of which they don’t know where they are coming from. 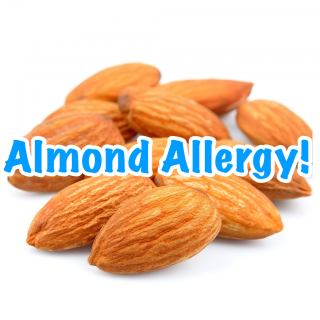 Paleo Tips allergy, almonda. permalink.